Let me now return to the events connected with the great battle on the Sakaria, but with your permission I will make some prelimin ary remarks by way of introduction. Nearly three months passed be tween the second battle of Inongu and the general attack which the Greeks began on the 10 th July, 1921. Our army had been mainly concentrated at Eski-Shehr, in the positions at Inongu in the north-west and in the district of Kutayah Altyntach. We had two divisions in the district of Afium Kara Hissar, one at Geiveh and another in the Maander district. Kemal Pasha 33 The Greeks had an Army Corps concentrated at Brusa and two others east of Ushak. They had also one division in the Maander district. The offensive of the Greeks was the signal for a series of bottles known as the bottles of Kutayah Eski-Shehr, which lasted for a fortnight. Themain body of our troops had retired on the evening of the 25 th July eastward across the Sakaria. I would like to mention here the chief reasons that had necessitated this retirement. The Greek army, which had been ordered to mobilise after the second battle of Inongu, was far superior to ours in regard to men, rifles, machine-guns and artillery. “After the army has been concentrated north and south of Eski- Shehr, we must establish a large area between it and the enemy s forces so that we shall be able to carry on our reconstitution, reor ganisation and reinforcement. For this purpose we would be able to retire even to the north of the Sakaria. If the enemy should pursue us without coming to a halt he would be getting farther away from his base of operations and would be obliged to take up new positions. In any case, he would find that there were many difficulties in front of him which he would have to provide for. Taking this into account, our army will be able to rally and meet the enemy under more favour able conditions. The disadvantage of such tactics would be the moral shock which might be produced in public opinion by the fact that a wide territory and places so important as Eski-Shehr would be aban doned to the enemy. But these disadvantages will automatically disappear in a short time as the result of the successes which we shall achieve. “Let us carry out without hesitation what the exigencies and the strategy of the moment demand from us. As for the disadvantages, we shall know how to overcome them. The disadvantages of a moral kind foreseen by me, soon began to take shape. The first excitement became apparent in the Assembly. Above all, the representatives of the opposition immediately began to make pessimistic speeches and express themselves in all possible tones: Where is this army going to? Where are the people being led? There must surely be somebody who is responsible for what is being done ! Where is the person? He is invisible. We would like to see at the head of the army the actual originator of the sad and deplorable position in which we are to-day. There was no doubt that the person to whom these people were alluding was none other than myself. Finally, Selaheddin Bey, deputy for Mersina, mentioned my name from the tribune and asked me to take over the command. The number of those who shared his opinion grew, while there were others who opposed them. We must now consider in a few words the reasons for this difference of opinion. Those who proposed to entrust me with the actual supreme command may be divided under two heads: From what I knew personally and the impressions of many others, some had come to the conviction that the army had been completely defeated, that there was no longer any hope of saving the situation and that the national cause which we were defending was irretrievably lost. Imbued with this conviction they wanted to relieve themselves by pouring out all their wrath upon me; they wanted me to perish at the head of the army which, as they thought, was in danger of dissolution and could not be saved. On the other hand, there were others I might well say the majority guided by their feelings of confidence and gratitude, who wanted to see me at the head of the army. Those who held a contrary opinion had doubts about my taking over the supreme command and expressed their opinion in this way: It is not probable that the army will be capable of gaining success in any later fighting and that it will be compelled to retire still further. With all the possible care that the case demanded, I studied the opinions which had been formed during the course of these discussions. Those who thought as I have just now explained, advanced important arguments. The clamour of those who brought forward insincere demands influenced in a considerably disturbing way those who pro posed in good faith that I should take over the chief command. The entire Assembly came to the conclusion that my taking actual charge of the supreme command was to be regarded as the last step and the last resource left to us. The point of view expressed by the Assembly about the situation also rapidly spread outside the Assembly. My silence and the fact that I showed no disposition to take over the actual supreme com mand in a hurry turned the fear of an inevitable and impending catastrophe into a positive conviction. As soon as I observed this I mounted the tribune. To the Honourable President of the Grand National Assembly of Turkey. At the request of the members of the Assembly and according to the general desire expressed by them, I accept the supreme command. I will take over this position provided that I shall actually exercise the full powers appertaining to the Assembly, for the purpose of being able to pursue as rapidly as possible the advantages resulting from the fact that these functions have been bestowed on me and that we may be able rapidly to increase and reinforce the strength of our army in a material and moral manner and secure for it a strong leader ship. In order to show the nation once more that I have been through out my life the most faithful advocate of the idea of national so vereignty, I request at the same time that these full powers shall be limited to the short period of about three months. My proposal offered an opportunity for the disclosure of the secret designs of those who tried to conceal their real intentions, and objec tions were soon put forward. For instance, they began to say: “We cannot confer the title of Commander-in-Chief, for that is an office that is morally inherent to the Assembly itself. We ought to say, Deputy Commander-in-Chief . ” The opinion was also expressed that there was no question of endowing me with such comprehensive privileges as to employ the full powers of the Assembly. I insisted on my point of view by maintaining that I could not accept an ob solete title which had once been bestowed by the Padishahs and Caliphs, all the more so because I could not see why they should re fuse me the corresponding title if I actually exercised these functions. We were passing through extraordinary conditions, of which fact the Assembly was well aware and as had been explained by its mem bers. Consequently, my actions and the decisions I had to make had also to be of an extraordinary nature. It would be absolutely necessary for me to be in the position to carry out my plans and decisions energetically and rapidly. Cases might occur where the situation would not admit of any delay, which would necessarily be caused by an appeal to the Council of Ministers or by demanding the authority from the Assembly. If I would have to ask every Minister or the Council of Ministers for their opinions or consent in every communication I had to make or with respect to every command I had to give, particularly when it was a question of communications and orders referring to the country and the employment of its resources, it would destroy all the advantages everybody was hoping for and which were expected to accrue from my personally taking over the supreme command. For these various reasons it would be necessary for me to be in the posi tion tqg^ive orders unconditionally, which I only could do if the full powers of the Assembly were transferred to me personally. Conse- quently, I persisted all the more strenuously in making this demand, because I believed that their consent was absolutely necessary to enable me to succeed. Some deputies, like Selaheddin Bey and Hulussi Bey, maintained that the Assembly would be condemned to inactivity if they were to transfer their powers to somebody else, that they had no right to do so, that above all it could not be thought of that the full powers of the Assembly should be transferred to the man who commanded the army, and that from every point of view this was superfluous. Some of the deputies went so far as to maintain that members of the Assembly would feel doubtful about their own personal safety towards any person who could dispose of the full powers of the Assembly. I did not attempt to refute any of these opinions. I declared that I found all of them to be quite justified. I merely said that the As sembly must attribute great importance to the examination of this question and study it with the utmost care. I added that those who were afraid of their own safety were quite wrong. As the question had not been decided on the 4 th August, the debate was continued on the following day. It was found on this day that the reasons that had led some deputies to hesitate revolved around two points : Firstly, the question whether the Assembly would not be reduced to im potence and inactivity in some way or another, and, secondly, whether any of the members of the Assembly would be liable to be treated in an arbitrary manner. After I had given them assurances to dispel these fears, I declared that it appeared to be necessary to add reservations and restrictions to the law which had to be passed. This clause gave lawful authority to my command. Following this appointment being conferred on me, I declared to the Assembly that “I shall prove myself worthy in a short time of the confidence which you have reposed in me,” and I laid before them some requests, among them being the separation of the duties of the Chief of the General Staff from that of the Minister of National De fence, which were still combined in the person of His Excellency Fewsi Pasha, so that he would be able to devote himself exclusively to the affairs of the General Staff. I also requested that Refet Pasha, Minister of the Interior, should be appointed Minister of National Defence, and that someone else should be selected to fill the office that would thus fall vacant. I took special care to explain to the Assembly that it would be very important for them and for the Council of Ministers to preserve a calm and firm attitude towards the country itself and foreign countries, and that it would be wrong to shake the position of the Ministers by trifling suggestions. The draft of the Bill was read to a public sitting on the same day, and was hurriedly discussed and put to the vote. It was passed unanimously. Having taken over the supreme command I still worked for several days at Angora. I formed my headquarters by uniting the official offices of the General Staff with the Ministry for National Defence. I installed a small office for my personal use in view of the effort to secure the unification and co-ordination in the common work of these two departments, as well as to settle with the aid of the authority of other departments questions which related to the army and the intervention of the Commander-in-Chief. My work at Angora was exclusively directed to the measures to be taken to increase the actual strength of men and means of transport, and to secure and regulate the provisioning and clothing of the troops. I consider that I ought to make this explanation so as to give you an idea of the great number of details that have to be thought of when the object is to win a war. By my Order No. i, I established a “National Commission for Requisitions” in every district. I regulated the method of the distribution of the result of the work of these Commissions to the various parts of the army. According to Order No. 2, every house in the country was required to prepare an equipment consisting of a parcel of linen, a pair of socks and a pair of shoes, and to hand it over to the Commissions. On the strength of Order No. 3, I confiscated, on the undertaking of later compensations, 40% of the following goods in store in the hands of merchants or the population: Linen, American cloth, cambric, cotton, wool and mohair, raw and manufactured, all kinds of material for the manufacture of men s summer and winter clothing, rough linen, calfskin, vaquette, sole leather, brown and black leather, Morocco leather, shoes, boots, iron shoe-nails, brass tags, cobblers and saddlers thread, iron for horse-shoes, nails, feeding bags, halters, horse-blankets, girths, curry-combs, pack-saddles, serge gloves, ropes, etc. Order No. 4 provided for 40% of the following goods in store also being confiscated: Corn, straw, flour, barley, beans, oats, chick-peas, lentils, slaughter beasts, sugar, petroleum, rice, soap, butter, salt, oil, tea, candles. Order No. 5 imposed upon the population the duty of conducting military transports free of charge once a month by such means as still remained at their disposal after the requisitions for the needs of the army had been made. By Order No. 6 all unclaimed goods which could serve for the clothing and provisioning of the army were to be confiscated. By Order No. 7 all arms and ammunition suitable for military purposes in the possession of the population were to be given up within three days. On the strength of Order No. 8, I requisitioned 40% of all the stores of benzine, fats, vacuum-oil, tallow, machine-oil, pocket- watches, sole-leather, vaseline, motor-car tyres, lorries, solutions, candles, cold glue, French glue, telephone instruments, cables, electric poles, wires, insulators and similar articles, sulphuric acid. In virtue of Order No. 9, I commanded a list to be made of all smithies, joineries, foundries, saddlers workshops, harness-makers workshops, cartwrights and planing workshops, with the names of the craftsmen and the capacity of each workshop, I had a list made of all armoury artificers who could make swords, daggers, lances, bayonets, and saddlery. By Order No. 10 I also confiscated 10% of four-wheeled spring carts; of ox and horse harness for four-wheeled carts, “Kagni” (two- wheeled carts) with harness, as well as 20% of draught animals, riding animals and others suitable for artillery purposes ; of beasts of burden, camels and donkeys. In the district of Kastamuni, Samsoon, Konia and Eski-Shehr I ordered the Independence Courts which I had established, to begin their work with the object of securing the execution of my orders and instructions. Such a Court had also to sit at Angora. On the 12 th August, accompanied by His Excellency Fewsi Pasha, Chief of the General Staff, I left for Pulatli, where the headquarters at the front were. We had arrived at the opinion that the enemy, as soon as he came into touch with our front, would attempt an en veloping movement on our left flank. In view of this possibility, I courageously took all the necessary steps. Events proved that we were right. On the 23 rd August the enemy s army came into serious contact with our front and opened an attack on it. Many sanguinary and critical phases, advances and retreats, took place on both sides. The enemy, superior in number, broke through our line of defence in several places, but each time they did so we succeeded in throwing our forces against him. The battle took place on a front of a hundred kilometres. Our left wing had withdrawn to a distance of fifty kilometres south of Angora. Our front, which was facing westward, turned to the south. The rear part of the army leaning on Angora was pushed to the north. Thereby we changed the direction of our front, but this was not to our disadvantage. Our lines of defence were broken through, one section after another, but every place where it was pierced was immediately reinforced in as short a time as possible. For the purpose of destroying the theory according to which all hope of success is to be placed on the lines of defence and if these are broken through the army must retire to a distance corresponding to the strength of the men engaged, I thought it well and proper to express my ideas about the defence of the country in another way, and energetically insisted on my view. I said that there was no line of defence but a plain of defence, and that this plain was the whole of the country. Not an inch of the country should be abandoned until it was drenched with the blood of the citizens. Every unit, large or small, can be dislodged from its position, but every unit, large or small, re-establishes its front in face of the enemy at the first spot where it can hold its ground, and goes on fighting. Units which observe the neighbouring ones forced to retire must not link their own fate to theirs; they must hold their positions to the end. In this way every man of our troops obeyed this principle and fought step by step with the greatest devotion, and thus finally succeeded in crushing the superior hostile forces and deprived them of their power of attack and the possibility of continuing their offen sive, and defeated them. As soon as we were sure of this phase of the battle, we went over to a counter-attack, especially with our right wing east of the Sakaria river against the left wing of the enemy, and then against the chief parts of the front. The Greek army was beaten and was forced to retire. On the 13 th September no trace of the enemy was to be found east of the Sakaria. The great battle of the Sakaria, which lasted from the 23 rd August to the 13 th September, both days included, continued without inter ruption for twenty-two days and twenty-two nights and constitutes an unique example of a battle of the widest extent, not alone in the historical records of the new Turkish State but also in the pages of the world s history. 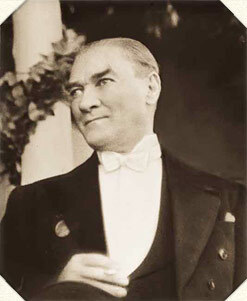 I believe that I fulfilled the first moral duty which I had taken upon myself when, on the occasion of my actual acceptance of the supreme command, I expressed before the Assembly and the nation my unswerving conviction that we would gain the victory, a con viction which I supported with the whole weight of my personality. But, in addition, I had other important duties to fulfil, duties of a material nature. One of them related to the attitude which I had led the nation to adopt while the war was going on. You are well aware that speaking of war does not mean two armies fighting against one another but two nations who are both risking their existence and who summon for the fight all their resources, all their possessions and all their material and moral forces. For this reason, I had to interest the Turkish nation in the war in all their actions, their sentiments and their conceptions, in the same way as the army at the front. Not only those who were facing the enemy, but every single individual in the village, in his home, in the fields, had to consider himself in the same manner as those fighting at the front as being entrusted with a special mission to dedicate himself with his whole heart to the conflict. Nations that fail to sacrifce their material and moral possessions to their fullest extent in the defence of their country, or that even do this reluctantly, cannot be looked upon as being decided to carry on a war or as being convinced that they will bring it to a successful issue. In future wars also, the decisive element of victory will be found in this conception. The great military nations of Europe have already officially begun to adopt this principle. When we took over the supreme command we did not demand from the Assembly a “Law for the Defence of the Country,” but we tried to achieve the same aim by issuing commands which, supported by the full powers bestowed on us by the Assembly, had legal force. In a more extensive, more positive and more definite manner the nation will establish the means and conditions in future which are adapted to render our dearly beloved country unconquerable, by studying the experiences we have made to-day and allowing them selves to be guided by them. But I had yet another duty to fulfil, namely, to take part person ally in the fight, to join the ranks of the army and carry on the fight myself. I consider that I also fulfilled this duty well within the limits of possibilities, although accidentally I broke one of my ribs. I held no military rank until after the battle on the Sakaria. After it was over the Grand National Assembly promoted me to the rank of Marshal, with the title of the Ghazi. You are aware that the military rank conferred on me by the Ottoman Government had been taken away from me by the same Government.